WaterNSW to mark half century since Burrendong Dam built. WaterNSW is inviting former dam builders along with the broader community to mark 50 years since the construction of Burrendong Dam was completed. 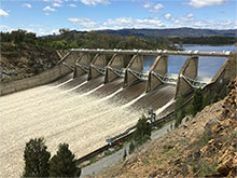 WaterNSW will host a series of events over 18-19 August this year to mark the economic, recreational and flood mitigation benefits the dam has provided to communities in the Macquarie valley for half a century. Located near Wellington in Central West NSW, Burrendong Dam is one of the largest inland dams in NSW with a capacity of 1700 gigalitres, which includes 1200 gigalitres of water storage and a potential 500 gigalitres of surcharge for flood mitigation. Construction of the dam began in 1946 and was not completed until 1967. Events will include a commemorative gathering on Friday, 18 August, for former construction employees, and a wreath laying for those who lost their lives during construction. On Saturday, 19 August, dam tours departing by bus from Wellington will take members of the public over the dam wall and to the spillway. The 50th anniversary events coincide with Wellington’s bicentennial celebration and are supported by Dubbo Regional Council. WaterNSW will also be hosting a marquee in Cameron Park at Wellington on Saturday, 19 August, as part of the bicentennial celebrations including historical information about Burrendong Dam and activities for kids. Media contact: Tony Webber 0428 613 478.